Its competition time again!! 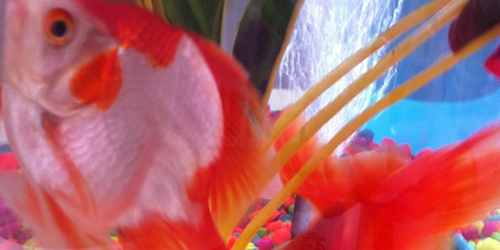 Steve’s got 2 new pet fish and we want one of you lucky punters to name them!! They are “Ryukin Goldfish” and they are sisters. Get your ideas over to us via the comments box below, Twitter, Facebook or email us at fish@steve-edge.com. The winner will recieve a Ltd Edition Steve Edge Cockney Rhyming Slang poster!! Final entries this Friday. @EdgeDesignLtd #competition I think you should call them Florence and Ermintrude! Joy & Babs as a salute to the Beverley sisters, famed Bethnal Green trio who shot to fame with hits included “Sisters”, “I Saw Mommy Kissing Santa Claus” and “Little Drummer Boy”. Joy later married Wolves legend Billy Wright! Come on Wolves! Bonnie and Clyde are a classic pair! How about Dali and Gala? Suitably artistic for you Steve? Got to be Salt and Vinegar………..